Agreement Promises Major Leap Forward in Automation of Diabetes Management. Abbott Will Supply Bigfoot with the Next Generation of its FreeStyle® Libre Glucose Sensing Technology For Clinical and Commercial Use. Abbott Park, Ill, and Milpitas, Calif., July 13, 2017 – Abbott and Bigfoot Biomedical today announced that the companies have entered into an agreement to develop and commercialize diabetes management systems, integrating Abbott's FreeStyle® Libre glucose sensing technologyi with Bigfoot's insulin delivery solutions in the United States. This collaboration brings people living with diabetes a significant step closer to the ultimate goal of eliminating much of the daily burden of diabetes management. As part of the agreement, Abbott will provide Bigfoot with the next generation of its FreeStyle Libre glucose sensing technology. Bigfoot will utilize this technology in the development of the first-ever personalized, user-friendly systems intended to optimize insulin delivery without the need for fingerstick calibration of a glucose sensor. "Diabetes is increasing at record rates globally. There is a significant demand for tools that are intuitive and easy to use to help people take control of this complicated, challenging condition, but innovation in this area has been slow," said Jared Watkin, senior vice president, Diabetes Care, Abbott. "Together with Bigfoot, we are challenging conventional methods of diabetes management by bringing together our expertise in superior glucose monitoring technology with a best-in-class insulin delivery system that is designed with the patient in mind. This will fundamentally transform the way diabetes is managed." All people with Type 1 diabetes, and nearly one third of people with Type 2 diabetes, must inject insulin to manage their glucose – that's more than 6 million peopleii in the U.S. alone. Bigfoot and Abbott both share a vision to simplify the use of diabetes management systems for these insulin users: a goal that moves beyond technology and into accessibility and cost reduction for individuals, their health care providers and payers. "Bigfoot is committed to solving the hard problems inherent in blending consumer technology, enterprise systems and Class III medical devices in an effort to design an easy-to-use system for people with diabetes," said Jeffrey Brewer, Bigfoot Biomedical president and Chief Executive Officer. "Both Abbott and Bigfoot understand the real-world use of diabetes devices. A no-calibration glucose sensor is the final piece of the puzzle needed to enable consumer-friendly and accessible integrated insulin delivery systems." Bigfoot has both injection and infusion pump-based insulin delivery systems in development. These investigational systems utilize intuitive design, Internet of Things connectivity, smartphone technology and machine learning automation to adjust insulin delivery or dosing with the intent to keep glucose levels in an optimal range. Bigfoot anticipates initiating a pivotal trial incorporating FreeStyle Libre technology in 2018 at clinical research sites across the United States. Abbott's FreeStyle Libre system was introduced across Europe in 2014, and is now available in more than 35 countries and used by more than 300,000iii people with diabetes around the world. Two published clinical trialsiv and real-world evidence from more than 50,000 usersv show that people who use the FreeStyle Libre system scan their glucose levels an average of at least 15 times per day. The studies show that people who scan more frequently spend less time in hypoglycemia (low blood sugar) or hyperglycemia (high blood sugar) while having improved average glucose levels, demonstrating improved glucose control overall. "Our companies have a shared commitment to developing products that are patient focused – simple, convenient, discreet, affordable and provide actionable information," said Brewer. "We could not be more excited to be collaborating with Abbott's outstanding team in bringing new innovations to people with diabetes." In the U.S., the FreeStyle Libre system is currently pending approval by the U.S. Food and Drug Administration. Abbott will supply glucose measurement sensors for all of Bigfoot's insulin delivery systems in the U.S. as the exclusive sensors for those systems. 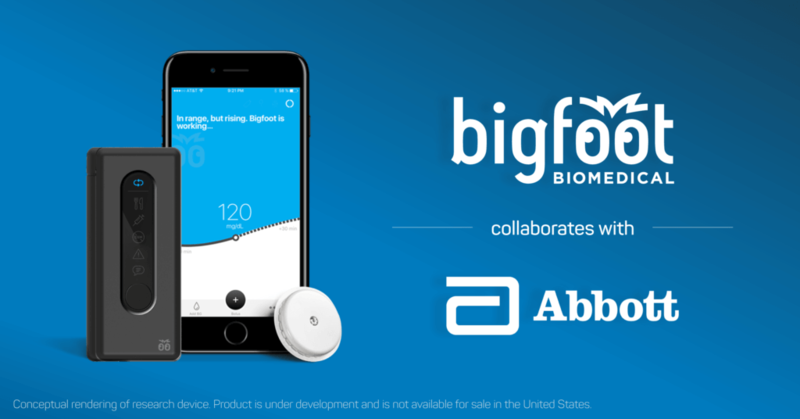 Bigfoot will develop and commercialize multiple systems using Abbott's FreeStyle Libre sensor technology, including systems designed to perform auto-titration for Bigfoot's connected insulin injection devices, as well as automated insulin delivery using Bigfoot's insulin infusion platform. Financial terms are not being disclosed. Bigfoot Biomedical was founded by a team of people with a personal connection to type 1 diabetes and, with its insulin delivery services, seeks to change the paradigm of care for insulin-requiring diabetes by leveraging data, connectivity, automation, and machine learning to reduce the burden on people with diabetes and maximize the leverage of health care providers. Learn more at bigfootbiomedical.com. Follow us on Twitter @BigfootBiomed and Facebook. At Abbott, we're committed to helping people live their best possible life through the power of health. For more than 125 years, we've brought new products and technologies to the world -- in nutrition, diagnostics, medical devices and branded generic pharmaceuticals -- that create more possibilities for more people at all stages of life. Today, 94,000 of us are working to help people live not just longer, but better, in the more than 150 countries we serve. Connect with us at www.abbott.com, on Facebook at www.facebook.com/Abbott and on Twitter @FreeStyleDiabet, @AbbottNews and @AbbottGlobal. iPending FDA approval. Not available for sale in the U.S.
Bigfoot Biomedical was founded by people affected by and living with Type 1 Diabetes (T1D) and is committed to leveraging data, people, and smart technology to create a connected ecosystem of solutions that will deliver improved outcomes valued by patients, providers, and payers. Bigfoot's investigational automated insulin delivery system, otherwise known as an "artificial pancreas," was inspired by a proof-of-concept system that's been used for over 50,000 hours. iPhone® is a registered trademark of Apple Inc. COPYRIGHT © 2015-2019 BIGFOOT BIOMEDICAL, INC. ALL RIGHTS RESERVED.